It seems like everyday, in one of my writing discussion groups, folks are looking for someone to collaborate with, on a writing project. They want someone to help them write books, screenplays, and blogs. The problem is those seemingly innocent requests are fraught with issues–sometimes costly issues. Why? Because oftentimes writers are right brained thinkers who never stop to think about the business issues of an endeavor, until it is too late. A word of caution, for those seeking collaborators. 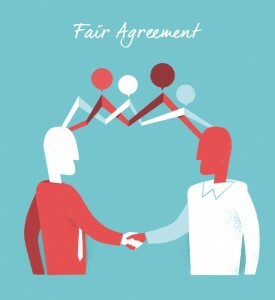 Unless you want to inadvertently risk entering into a joint-copyright arrangement, you should have a well-drafted, clearly defined agreement in place, BEFORE you discuss your idea with another person—regardless of who it is. Plus, it is wise to be crystal clear what the terms of the relationship will be BEFORE you enter into the relationship. There have been many lawsuits regarding ownership of rights, where collaborators were involved. Don’t leave such an important issue to a “friendly handshake”. This becomes especially important once your work hits pay dirt. Protect yourself now, while you are still in control and while the choice is still yours. Know who you are dealing with. Do your due diligence. A writing collaboration is a business relationship. Treat it as such. Have clear expectations before you start working together. Talk things through. Make sure the other party(s) understands what you want, from the start. Reduce those clear expectations to writing. Having a well drafted, enforceable contract in place BEFORE you start will help you avoid the nasty problems, which could land you in court later. Remember, a writing collaboration is a business relationship. Treat it as such. Until next time, I am Attorney Francine Ward helping you protect what’s yours. Join my conversation on my Facebook business page, Twitter, LinkedIn.